In this field, write the text that you want to display on the button. For example, “More Info”, “Submit”, ” Cancel” etc. 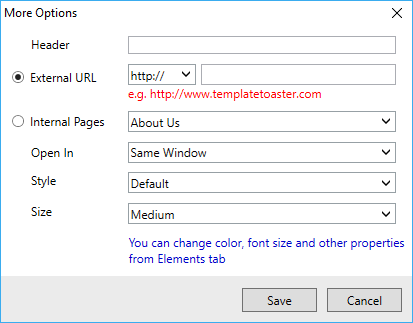 It is a radio button to make a choice between External URL and Internal pages, to place the button. If you select External URL, specify the URL you want to link with the button. If you go for Internal Pages, it will display the list of all pages of the site/template you made and you can select any out of these. To select the target window in which the specified URL will open. Avails you to select a preferred BOOTSTRAP button style. You are given six BOOTSTRAP button styles – Default, Primary, Success, Info, Warning, and Danger. Specifies the size of the button. Four size options are available to you: Medium, Large, Small and Extra Small. Save button applies the changes. To cancel the changes and closes the dialog box.